Another Wednesday, another culinary adventure. Ben found a fun recipe for rainbow noodles. 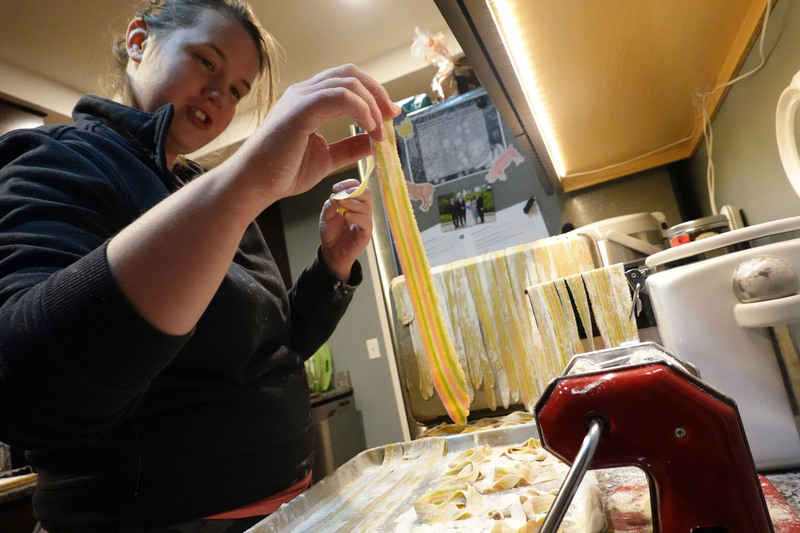 We used spinach, carrot, and beet to create the green, orange and red stripes in the noodle. After being cooked the red faded a bit, but you can still see the layers. 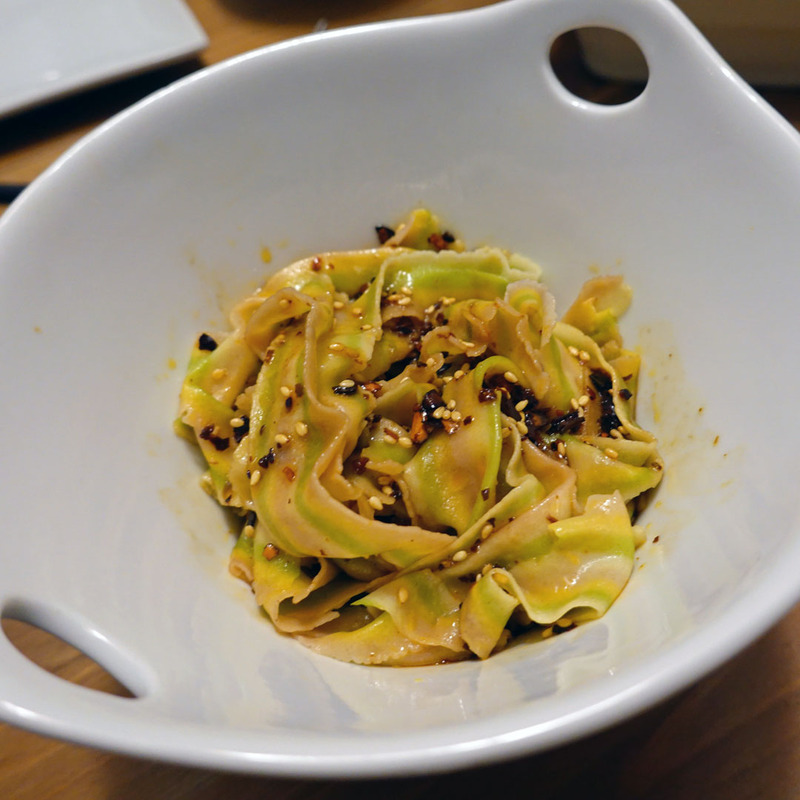 The noodles turned out really well in the end and the sauce Ben made to mix with them was amazing. A lot of depth of flavor and the chili oil was homemade. 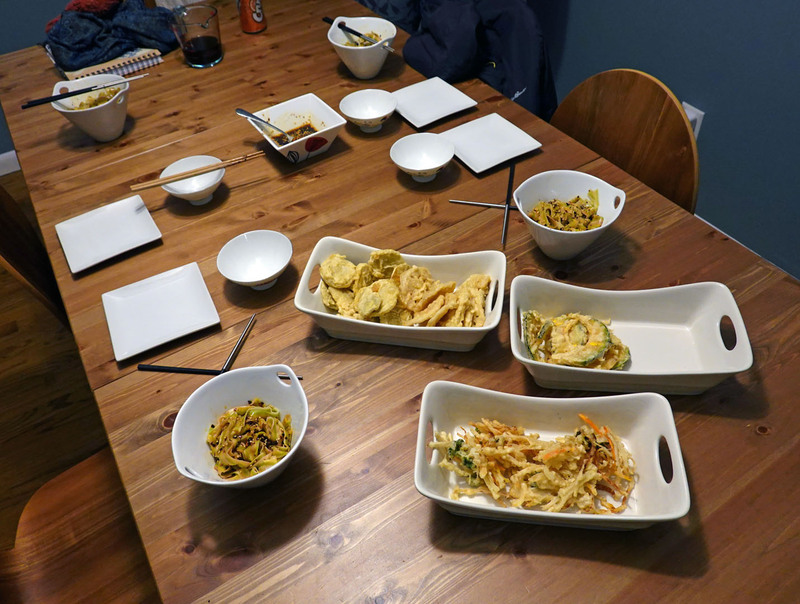 I cooked up some kakiage to pair with it and we cut up some shrimp, lotus root, sweet potato, and kabocha to tempura. 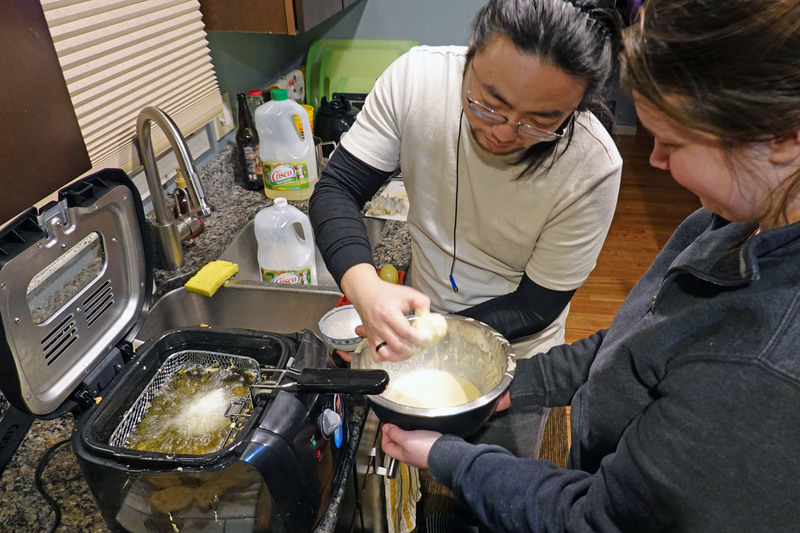 Ben came up with a novel idea of freezing some eggs and then coating them with batter to deep fry as well. 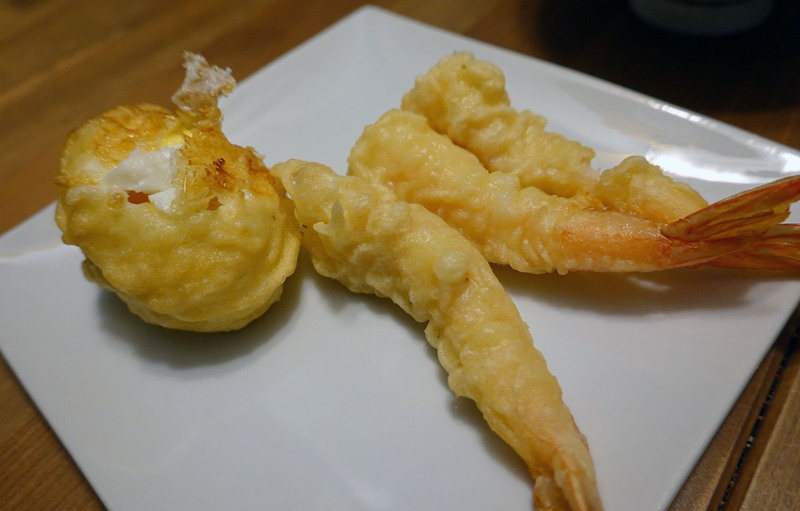 Now I’ve made tempura in the past, with varying degrees of success. 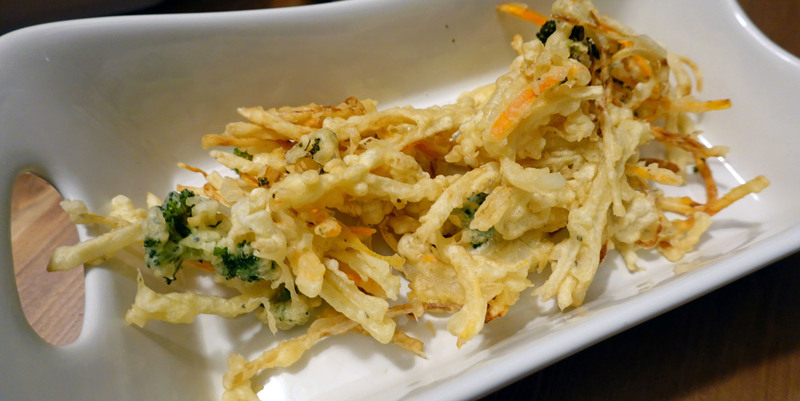 This time I felt was the best tempura I’ve made. I think it had to do with the correct tempura water and the correct amount of mixing. What probably also helped was the deep fryer Dante gifted me for Christmas. What a great test run for it, and it performed admirably. I look forward to making some truffle fries in the future. The rest of the week went by pretty uneventfully. I had an Impossible burger for the first time at Disney World when we were eating our way around the world at the Epcot Food & Wine festival. I thought it tasted marvelous then, so when I found out White Castle was selling them I had to try it again. I’ve now tried two types of vegetarian burger patties that are designed to emulate meat. Beyond Burger also sells patties at Kroger. I was a fan of both. It’s been a while since I had the beyond burger and I cooked it myself so it’s hard to remember how it compared to the Impossible burger. I’ll have to try it again soon, but based on my current feeling I think the Impossible has my recommendation. They are both extremely close though. The textures are remarkably similar to meat and even the taste is pretty close. I’m excited to see what the Impossible 2.0 will bring. Hopefully it’ll be released for consumer purchasing soon. Another exciting even that happened was our first snow of the year! Well the first snow that stuck anyways. I’m definitely a winter guy. I love the snow, the cold weather, the crispness of the air. I am of the predilection that winter is better than summer. I think summer is actually my least favorite season. I can always put on more layers if I’m cold in the winter. I was excited to see the snow sticking, unfortunately my joy has been short-lived as it started raining recently, so most of the snow is probably going to get washed away. What isn’t washed away will be melted by the warm weather that is coming for a day or two. Hopefully more snow will appear soon. 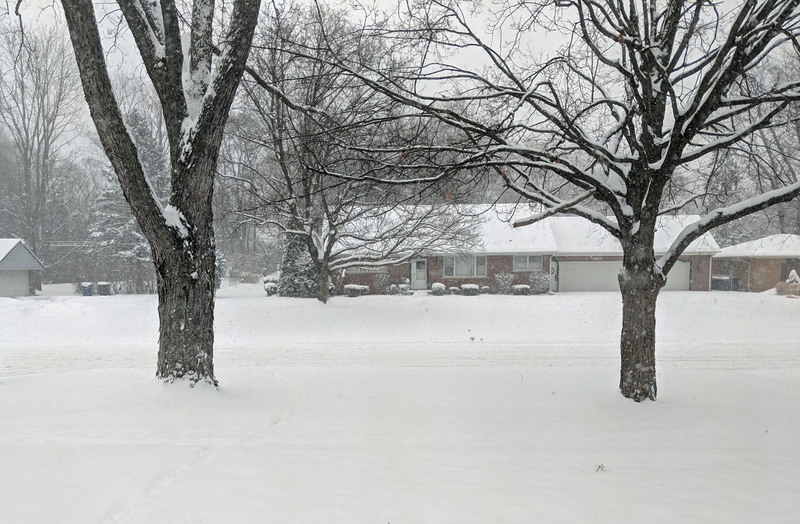 I can’t tell if when I was a kid, there was more snow or if it’s just because I was smaller that the snowfall seemed heavier and the snow piled higher. I miss those days. Last but not least, on Tuesday before I went to see Glass I stopped by what used to be New Seoul Garden at Telegraph and 696. Apparently the whole building has been renovated to be New Seoul Plaza. It’s got a modern look and a great aesthetic. 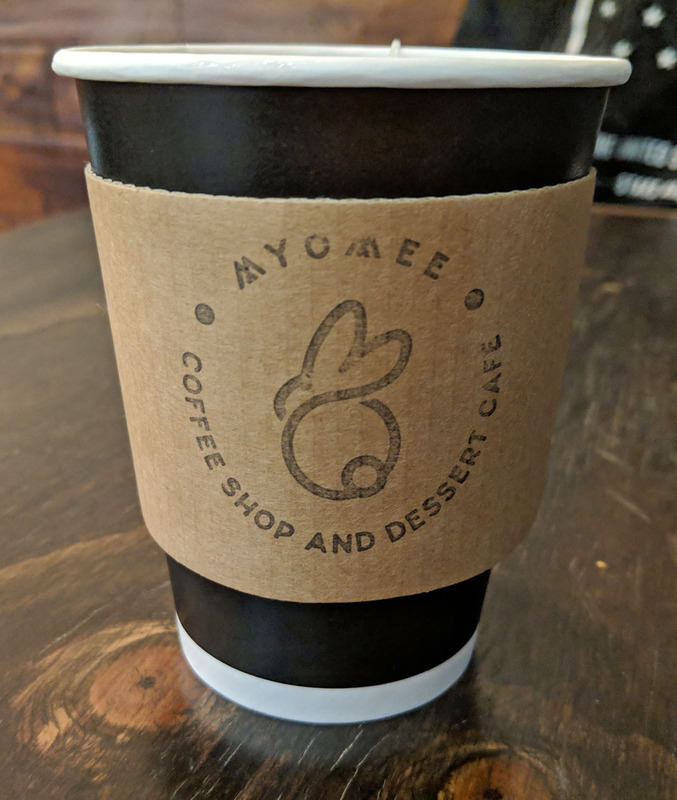 I stopped at Myomee to get some tea with a friend and catch up. He ended up getting a bing su (which given the weather I was befuddled) and let me try some. 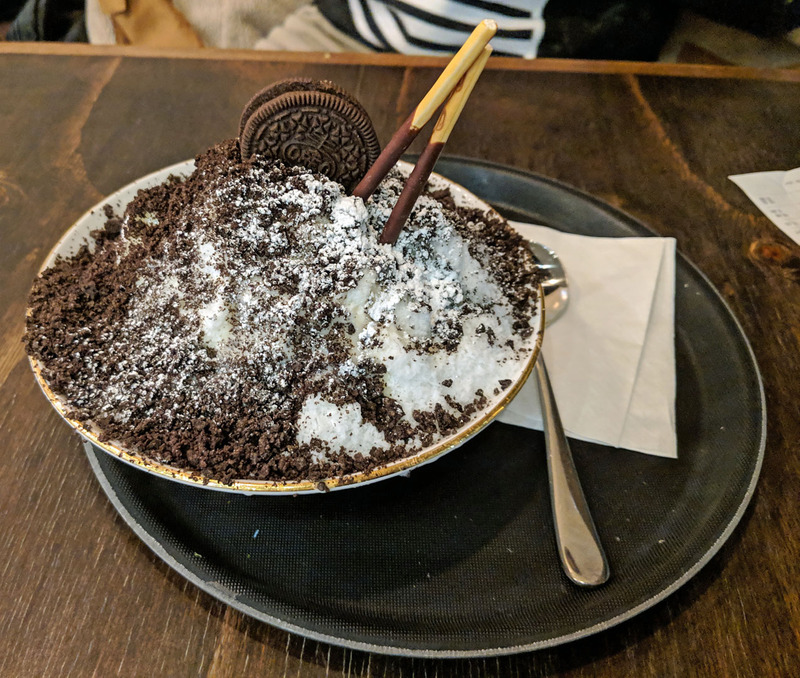 Now I’ve had some bing su in my life, but usually with Asian toppings like syrup, red bean, condensed milk, lychee, etc. This Oreo flavored one was an oddity to me. It was wonderful though. I was surprised how much I liked it. 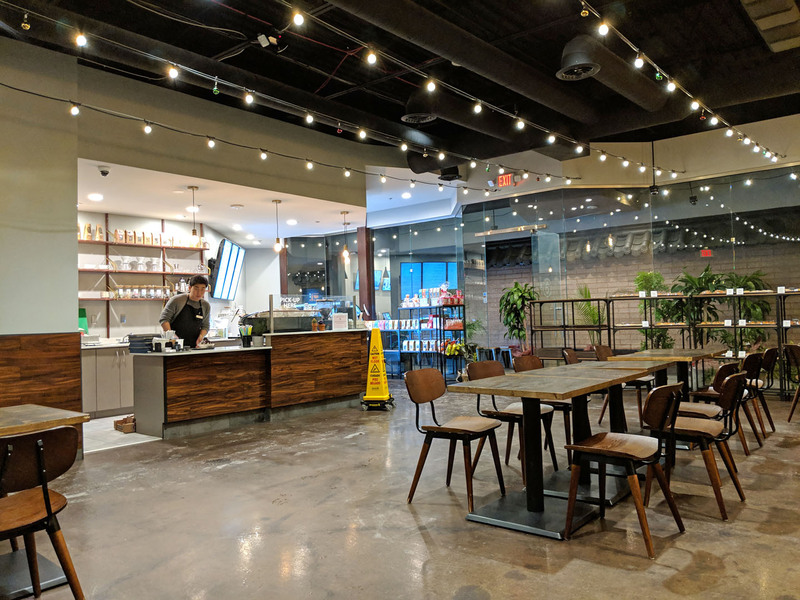 I highly recommend checking this place out. I’ll definitely be back with some friends to try some different flavors. After my rendez-vous, I went to go watch glass. Tuesday is $5 movie night at AMC with a Stubs membership (totally worth the $15 I pay annually). I really loved Unbreakable when it came out. I kind of feel it flew under the radar when it came out. Then when I saw split last year and the post-credits scene showed Bruce Willis as David Dunn watching the news report, I was ecstatic. I wondered what this could mean for a sequel, because how could they not make a sequel after that. Turns out, it was in the works already. Glass was good. I felt there were a lot of smart story choices, and James McAvoy is just phenomenal as the beast. Sarah Paulson, Bruce Willis, and SLJ also give great performances, but McAvoy very convincingly portrays a multitude of personalities in his one character and does so fluidly and effortlessly. The pacing at the beginning of the movie seemed a little strange, as Dante put it: “The writing seemed to get better as the movie went on”. I think it’s because there were multiple story threads that were going on and Shyamalan very clunkily jumped between them, but as they converged the transitions became easier. They did a fantastic job of making it a stand-alone movie (which may have also explained the issues I had with pacing at the start of the movie). It’s unnecessary to see Unbreakable or Split to fully understand Glass, but you are definitely more informed if you have seen them before. A great movie overall, I recommend seeing it. I’m not sure if I’m going to make movie reviews a regular things, but I also don’t want to do a critical review of a movie. Just maybe give it my thoughts and let you guys make your own opinions. I don’t really expect any feedback on this, but feel free to leave some!